Do you have someone in your life that LOVES coffee? These coffee gifts are such good gift ideas for coffee lovers for Christmas this year! Today is Monday, which means its my queue to grab that 2nd cup of coffee (or 3rd ;). Why is it that Mondays are always harder that than rest? Is it because our hearts are still hanging on to yesterday and Saturday? Or is it because we know we have another whole 5 days until we get another weekend? It’s a little of both I think. 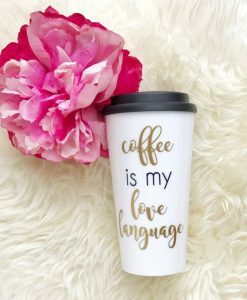 In honor of those on their 2nd cup of the day, I’m sharing some coffee gifts for coffee lovers. Whatever your Monday looks like today, I’m sure coffee can handle it. 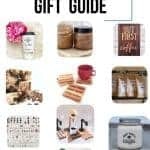 This coffee gifts post contains affiliate links, but nothing that I wouldn’t wholeheartedly recommend anyway! Read my full disclosure here. Are you ready to see these coffee gifts? Also today’s coffee gifts are ALL (yes, every single one of them) from Etsy. 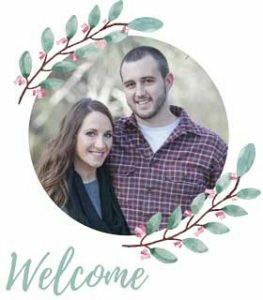 I am a huge fan of Etsy for so many reasons. First of all, I have an Etsy Store, Manzanita Exchange, and I love being able to make crafts for people all over the world. I can’t think of any other platform that helps makers sell their handmade goods better than Etsy. I encourage you to join the #shopsmall movement and make a commitment to buying some of your Christmas gifts on Etsy or other local makers or small businesses in your town. By doing so, you’re directly supporting people just like me. Nothing beats an awesome coffee scented candle to go with your morning cup of joe. 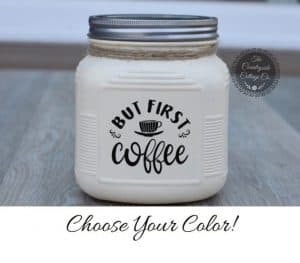 This one comes in a small mason jar that is just too cute and “smells like the perfect coffee drink with cream, caramel and vanilla”. This would made a great stocking stuffer too! Coffee lovers need somewhere to store all those coffee beans right?! This adorable coffee canister is perfect! I love the fact that you can customize the color. Would go perfect in a farmhouse kitchen! I seriously use this quote far too often. Pretty much anytime my husband is talking at all to me in the morning before I’ve made my coffee, I usually mutter this. 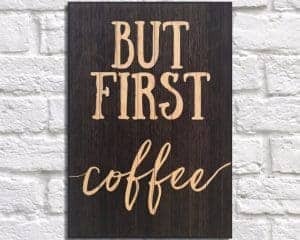 These wood signs from WoodPrintz are so unique. They actually bake the print onto the wood tablet using special UV ink. Pretty cool, right? Coffee snobs everywhere claim that pour-over coffee is better, so naturally any great coffee addict needs a way to make pour-over coffee. 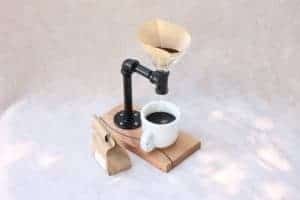 This unique pour over system has a fun industrial look. Yes, that’s right. 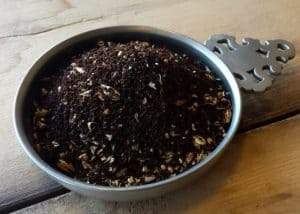 It’s coffee blended to mimic different styles of beer. This sampler pack will get you four 2.5 oz bags. You’ll get to try scottish ale, winter warmer, chocolate stout and black IPA. I was definitely intrigued when I saw this and instantly ordered some for my hubby’s stocking. Shhh…! 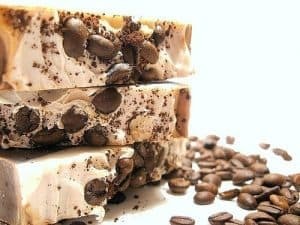 Soap makes an excellent gift during the Holidays and this coffee soap is one of my favorite ideas for coffee gifts! 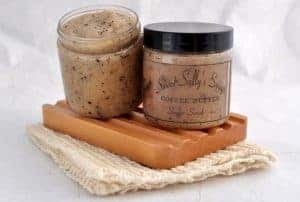 The ground coffee beans in the soap provide exfoliation and it’s scented like a cup of coffee. 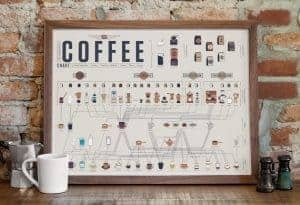 I love this modern looking coffee chart poster that displays the many ways to prepare our favorite beverage, coffee. If you know me, you know I LOVE pallets. So when I saw these mini pallet coasters, I fell in love. Are they the cutest? I’ve seen the little popsicle stick ones online, but I just don’t know how durable they would be. 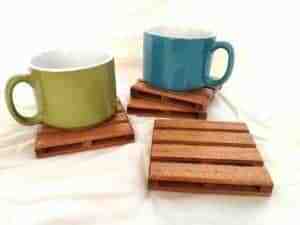 These high quality pallet coaster are made to last. The maker, Chris, mentions in the description: “my mother-in-law still uses one of the first sets I made and gave to her 5 years ago…and they are still holding together as strong as the day they were made.” He also sells specialty green coffee beans for those coffee lovers that want to take the extra step and roast their own. 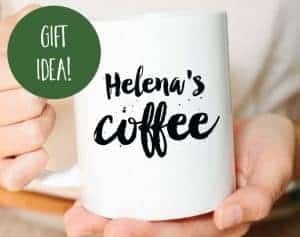 Such great ideas for coffee gifts! What’s a coffee lovers worst nightmare? Having someone steal your coffee, of course. This personalized coffee cup will make sure no one takes your coffee or your mug. The sweet scent of coffee butter in a scrub packed full of antioxidants? Yes please. These gift ideas for coffee lovers are spot on. This double walled mug is perfect for the coffee lover that has a morning commute. You can also order this design as a regular porcelain mug or a black travel mug too! Well, did you finish your cup of coffee yet? Now go fill up that coffee cup again! … It’s Monday (as if you need an excuse). 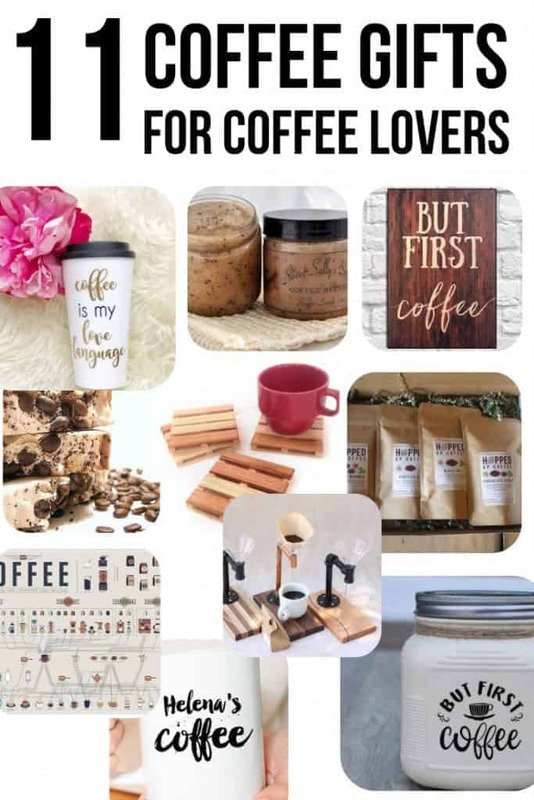 What was your favorite of these gift ideas for coffee lovers?